I had a pretty good weekend. Restful. Downtime. I did some things on Saturday, then took Sunday off, pretty much. Just hung around the house, organized some things, did some reading, caught up with my email, and gave some family members a call. One of my siblings is in the hospital, and I may need to travel to help them out. But it may turn out to be nothing. They’ve had physical disability issues for many years, and this is one more in a long series of troubles they’ve had. I’m not making light of it. They’re having all sorts of tests done. But it may turn out to be just a speed bump, rather than a sinkhole, in the road of their life. They’ve been through this kind of thing many times before, and we all know it’s a wait-and-see type of situation. If I have to go, I’ll go. They may need me. But for today, I’m taking it easy. I’ve got a late night tonight, so I need to get an early start on the day. I’m seeing my new neuropsych again. I’m bringing them up to speed on my childhood. They’ve worked with a lot of kids, in the past, and this will help them better understand where I’m coming from. This is important for both of us. With my history of mild TBI as a kid, it can shed important insights on what shaped me into the person I am today. And it also highlights the differences between the world I grew up in, all those decades ago, and the world we live in now. I was telling my neuropsych about the time when I ended up on the bottom of a pile of kids during recess in 5th grade got my neck/head hurt. I knew I’d gotten hurt and after I crawled out from under the pile, I walked away in a daze, just walking across the field where we were playing, trying to put as much distance as possible between myself and everyone else, because I didn’t want to get hurt again. After that, I didn’t want to play rough. I was confused. I was out of it. My grades dropped like a stone tossed into a pond. And the former A-student nearly flunked 5th grade. My teacher had to come to my house and talk to my parents about me not completing my work. They made me stick with it and complete my homework assignments, but it was a real battle for them, for many months. And I’m not sure I ever recovered from that experience. All of a sudden, I was stupid. I couldn’t think. Something was wrong with me. I wasn’t smart, after all. I was stupid. I couldn’t do it. I just couldn’t do it. My neuropsych asked me if I’d told anyone about getting hurt. I said, no, that’s not how we did things back then. You just picked yourself up and went back into the fray. Another thing that I didn’t add, was that I was so confused, I didn’t realize there was a reason for me to say anything. I’d gotten hurt similar to that many times, while playing. It wasn’t new — that time was much more extreme, however. All those other times I got clunked on the head and was a little woozy, I recovered. But for some reason, that time was different. And that just highlights the differences between how and when I grew up, and how things are now. Even if I’d told my parents or teachers, what could they have done? What indeed? 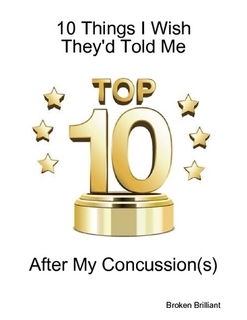 Nobody knew sh*t about concussion or mild TBI or neck/spine injuries back then. If anything, I would have just been a hardship to everyone, because my parents didn’t have the money or the time (they were both working) to really tend to me. Nobody had the time for me. And when they did try to help me, they did such a bad job of it, I thought I would have been better off just going it alone. And it makes me a little ill, to think about how blind and bound by ignorance everyone was, back then. Living in the country, in a place where you were never allowed to admit any hurt or any weakness, but you sucked it up and got back in there. Because that’s what was done. No cry-babies allowed. No weaklings. No quitters. So, I’m meeting with my neuropsych again today, and we’ll talk more about my childhood. I’ve got my box of favorite things I kept over the years. My parents cleaned out their attic years ago, and I got my childhood box from them. That and a bunch of photos of when I was a kid. School pictures, from first grade on. Other photos used to be in the collection, but I took them out, and I don’t know what happened to them. I think I put them in another photo album somewhere, but I don’t know where it is. I would like to find that. It’s classic, and it’s full of pictures that are worth more than 1,000 words. Thinking about being a kid dealing with mild TBIs all on my own… it was pretty rough. And I got tired of being punished for things I didn’t do on purpose. That’s probably part of why I have trouble with authority figures. I’ve been punished and disciplined and pulled back into line by force, by people in power so often, for no reason that I could tell — till after the event was over. They probably thought I was being difficult on purpose, but I just didn’t know. I didn’t remember things they told me. I misinterpreted what they told me. And then they came down on me like a ton of bricks. Because all I knew how to do was put on a brave face and act like I was in total control of everything. I wasn’t. But if I let on that I wasn’t, then I’d be vulnerable. And other kids or adults would beat up on me. Because they could. It was terrible, when it was happening. But that’s just how everything was. That’s just what happened. And I dealt with it. Now things are so much different. I still have residual resentment and distrust towards authority figures, but I’m dealing with it. I’m not nearly as bitter and angry as I ws in the past. And I have this amazing life that really keeps getting better. Standing at my desk, looking down at the bird feeder in my back yard, a young deer just appeared from the trees nearby and is looking for something tasty to eat. Beautiful. Just beautiful. This is all possible for me now, regardless of what has happened to me in the past. Maybe it’s possible because a lot of that happened. I know for damn’ sure, I’m a heck of a lot more resilient than other people I know who never had awful things happen to them on a regular basis. I figure, my childhood was like the price of admission to this life I have now. And it’s paid off. Being roughed up when I was a kid and being left to sort things out on my own… it wasn’t the most fun, but I learned a lot of lessons. And all of those lessons are helping me today. Monday’s here! I’m ready. Let’s do this.